While painting Martin Kaymer, a German golfer, I contemplated how golf is not a very popular sport in Germany. At the time of Kaymer's magnificent PLAYERS Championship win, the 2014 Soccer World Championship was underway. As German Chancellor Angela Merkel traveled to Rio to support Germany's players in the World Cup Soccer Championships, German enthusiastic focus was on soccer. 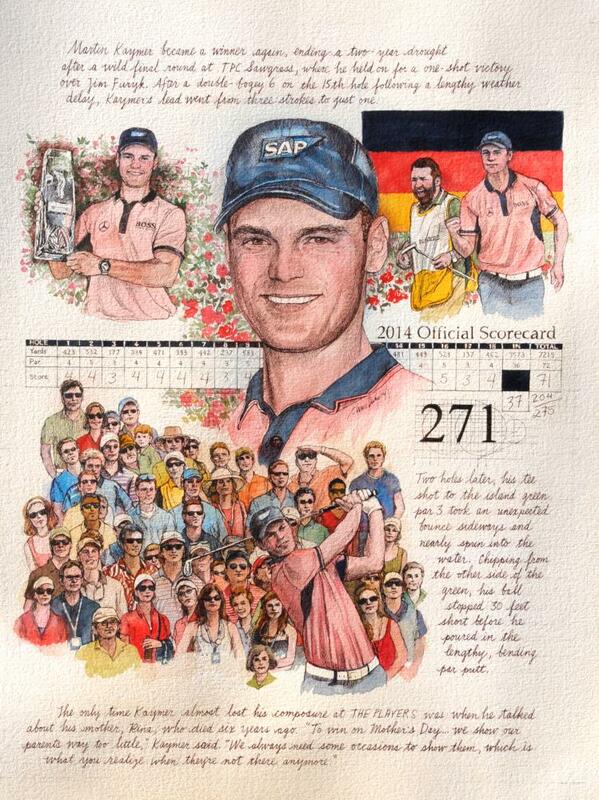 Thus, it felt particularly important to do a heroic piece of art that honors Kaymer's golf triumph. I admire Kaymer's quiet demeanor and gracious respect for his opponents on the greens. Golf is definitely a gentleman's game. I have to pinch myself when I think of the art I get to do of these oft-understated, steely and determined champs!